Use this liquid screen protector to guard your phone, tablet, or smart watch from scratches and dings with a few swipes. 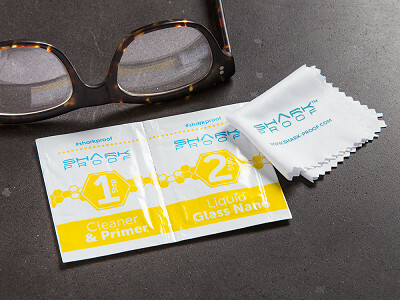 Shark Proof is a nano “liquid glass” wipe that you apply to glass (it even works on eyeglasses). The formula is engineered on a molecular level, which means tons of micro particles dry clear and create a tight bond with the screen’s glass. Those little “bodyguards” ward off scratches from things like keys, pens, and clothing. Shark Proof is non-toxic, transparent, and also protects against dirt, oil, and bacteria. Though the coating won’t make your phone waterproof, it will repel droplets and smaller splashes, too. Everything else on your phone will work as intended—touch features, like the thumbprint sensor or home button, and the microphone. The wipes work on flat and curved glass, but be sure to select the right formula for the glass you’re protecting. 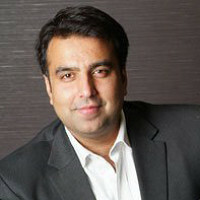 There are specific formulations for a smart watch (which needs a denser coating), eyeglasses, and any make or model of phones, laptops, and tablets. It’s important to note that the coating won’t protect against high impacts. So, if you’re prone to dropping your phone or tablet, you’ll still want an impact-resistant case. Shark Proof uses the engineering of nanotechnology, which is tiny engineering of materials, liquids, and solids formed in a structural honeycomb-like pattern. 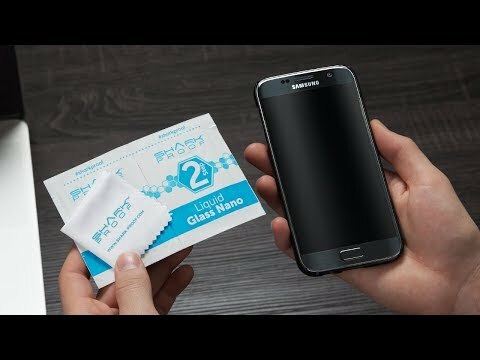 Manipulating the atomic structures creates a glass surface which bonds with your existing glass surface to create a screen protector; it works exactly how your traditional screen protector would work. 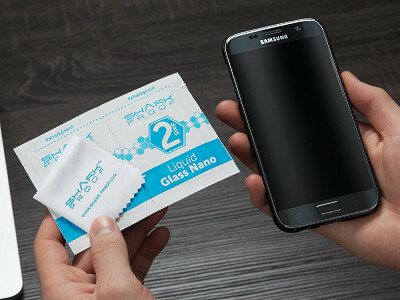 No, Shark Proof liquid screen protector has been designed, tested, and retested to ensure that it does not have any negative impact on your device. It is designed only to protect your device. Yes, Shark Proof is designed to specifically bond with the glass surface, on all other surfaces it will evaporate. We have designed our formulation specifically so that you can use it worry- and hassle-free on your entire device since often you will have a camera on the reverse and front top. When you buff the screen after applying the Nano Applicator, be sure to wipe clean the non-glass areas. No, Shark Proof is designed specifically to bond with the glass surface of your screen, not the plastic, rubber, or metal areas. 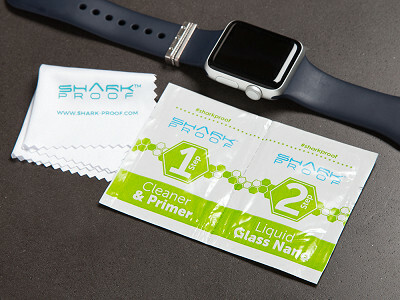 Shark Proof is durable against most things, however, if you are excessively exposing it to liquids, splashes or cleaning with alcohol based cleaning cloths then over time the nanotechnology Shark Proof layer will slowly wear off. We recommend you reapply coating after every 13-14 months depending on your usage. No, it is not advisable to put any liquid screen protector onto a cracked screen; your already cracked screen will further weaken and deteriorate. It is always advised to replace your screen first and then apply Shark Proof. 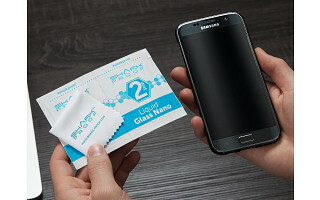 Use this liquid screen protector to guard your phone, tablet, or smart watch from scratches and dings with a few swipes. 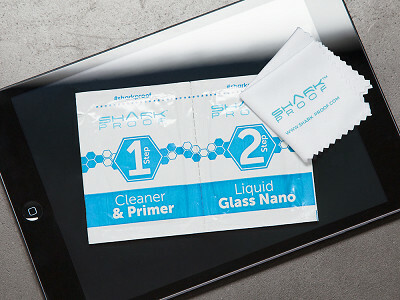 Shark Proof is a nano “liquid glass” wipe that you apply to glass (it even works on eyeglasses). The formula is engineered on a molecular level, which means tons of micro particles dry clear and create a tight bond with the screen’s glass. Those little “bodyguards” ward off scratches from things like keys, pens, and clothing. Shark Proof is non-toxic, transparent, and also protects against dirt, oil, and bacteria. Though the coating won’t make your phone waterproof, it will repel droplets and smaller splashes, too. Everything else on your phone will work as intended—touch features, like the thumbprint sensor or home button, and the microphone. The wipes work on flat and curved glass, but be sure to select the right formula for the glass you’re protecting. There are specific formulations for a smart watch (which needs a denser coating), eyeglasses, and any make or model of phones, laptops, and tablets.